Bar soap, castile hand soaps, lip balms, children's soaps, shea body butters, coco bath melts and sugar scrubs. Back in 1999, frustrated with the harsh soaps available on the commercial market, Ardis began making her own handmade soaps in small batches with ingredients she could pronounce in her kitchen. Soon her apartment in Closter, NJ was overrun with soap! 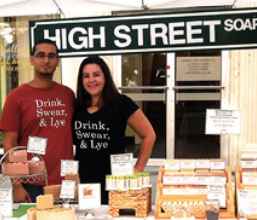 Her soaps are made with all-vegetable, food-grade oils using the traditional cold process method. Olive oil, shea butter and cocoa butter are the main ingredients and as many local and organic ingredients as possible are used. One of the things that makes handmade soaps special, is that it retains its natural glycerin. Glycerin, a byproduct of the soapmaking process, is a humectant that aids in keeping moisture next to your skin. High Street Soaps are free from sulfates, artificial surfactants, parabens and tirclosan. The fragrances used are light and lovely. Just one more thing that makes them special.